Happy New Year's Eve! 2018 came and went in a flash. For the last seven years I've written a year in review post......it is almost a requirement at this point! My first ever blog post was a New Year's one, believe it or not. I always love looking back and reflecting on what my years held, both as I write and as I look back years down the road. It is so fun to see how I've changed and grown with each passing year. 2018 can be called the year of travel - we went on [almost] one trip per month and I will cherish those memories forever. As all years do, it had some lows (i.e. surgery and home repairs) but plenty of highs, as well! Let's choose to remember the good! Hi Friends! I don't know how it happened so quickly, but 2018 has come and gone! This is my last monthly favorites post of the year and I'm pretty sure I started at least 50% of them with "How is it already [insert month]?". 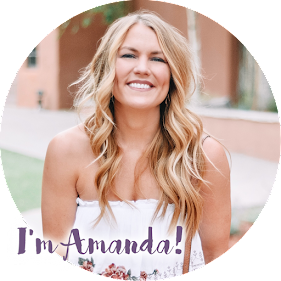 I've got lots of fun products and items to share this month... a lot of which I got as Christmas gifts! I always love getting new beauty products and little somethings in my stocking. My lifelong best friend gave me a beauty product advent calendar this year and it was such a fun gift to receive. She wanted me to have a little piece of her with me the whole season, so every day I got to open up a new mini beauty product! It was really fun and I've loved sampling them all December long - several of them made this list! I can't believe I've been written 12 Best of OKC blog posts. 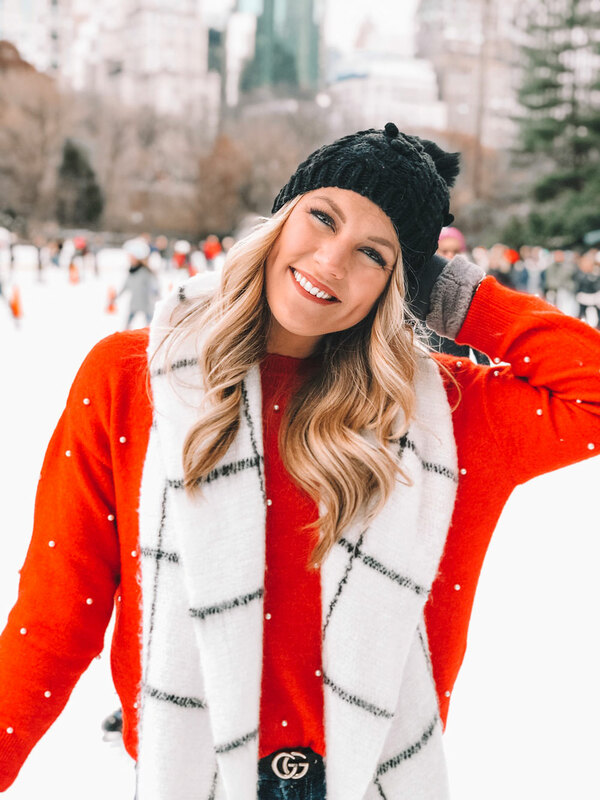 I had such fun time rounding up my favorite places in town this year....I'm going to have to think of a new spin to put on my local posts for 2019. I thought about going district by district and talking about my favorite things to do/see/eat in each neighborhood....thoughts?? Ideas? Suggestions? To wrap up my final Best of OKC post, I wanted to touch on everyday life in Oklahoma City. So, this is the Best of OKC according to me! 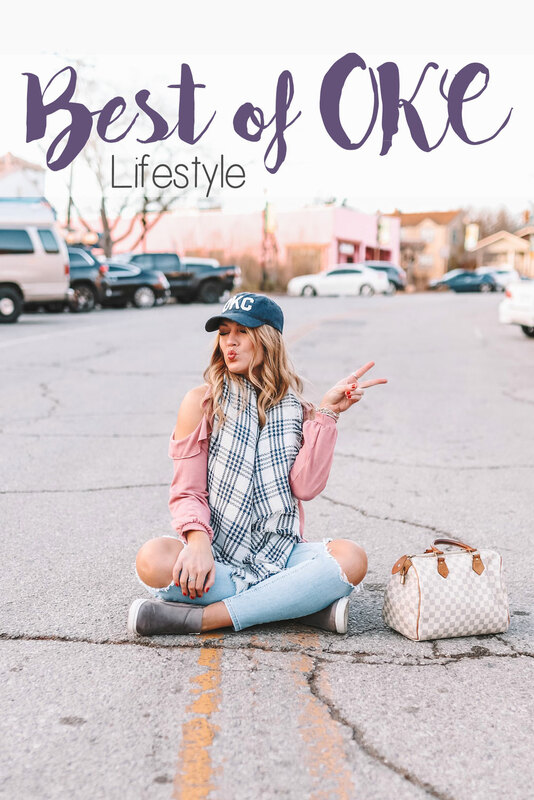 I get asked all the time where I get my hair and nails done, where I workout, who my favorite photographer is, etc., so I thought this would be the perfect opportunity to share my personal lifestyle choices. Think of it as my own "Best of OKC Awards" kind of like the newspapers do. Less than a week until Christmas WUT. I don't know how that happened but luckily I'm done with my shopping! 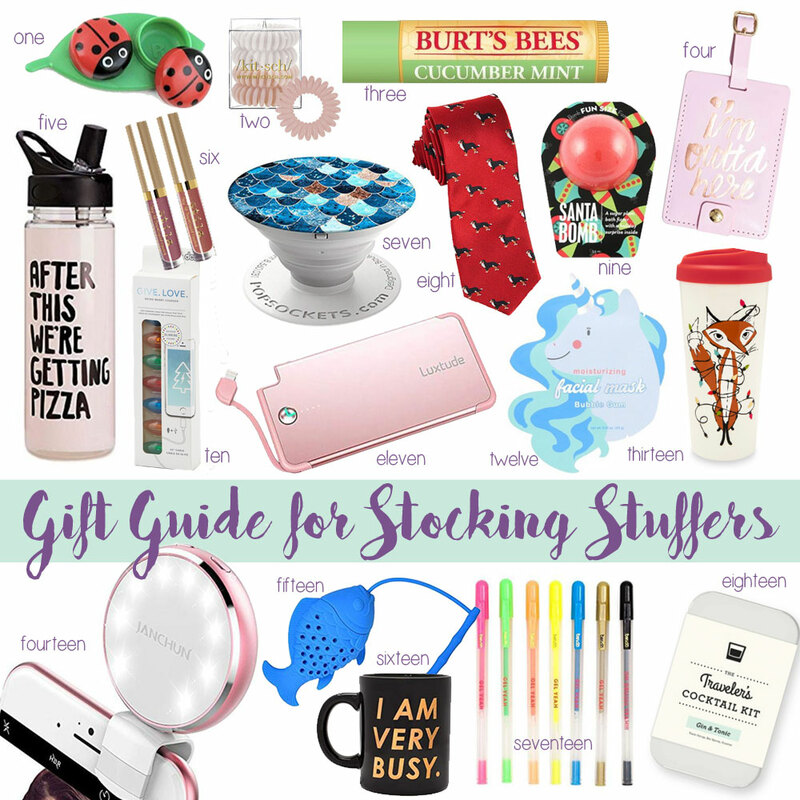 It seems like the stocking stuffers always get saved for last (at least they do for me) so for my last gift guide of the year, I rounded up some quick, cheap and fun ideas for you! Most of them are from Amazon so you can use prime shipping OR they're from stores that have physical locations in most cities....if you're tough enough to brave the crowds, that is! If you're using Amazon, they will let you know if it is expected to arrive before or after Christmas, just FYI! A lot of the things I linked have similar options if you just search on Amazon itself. I think girl's stocking are pretty easy to fill (lipstick, nail polish, pony tail holders, etc) but guy's can be a bit tougher! I tried to pick some things that were gender neutral + items for both guys and girls! Did Santa ever bring you something specific each year? I ALWAYS got dried pineapple (the best) and my brother got Wint-o-green Lifesavers. Cole's stocking always had Reeses stuffed in the toe! Were your stocking stuffers wrapped or no? I'd love to hear your traditions! In the Martin household, the pups are a v. important part of the family and Santa always visits them - regardless of if they've been naughty or nice! I've been called a crazy dog lady on multiple occasions and I have no shame in it. Since we don't have kids, my pups are my babies! And they bring so much joy into our home and lives. We usually give them some dog-friendly pup cakes from a local dog bakery along with a stocking full of toys, treats and if they're lucky, a new sweater, collar or leash! I love spoiling my pups but I also love giving and receiving dog-related items, they are always fitting, especially when they're breed specific! 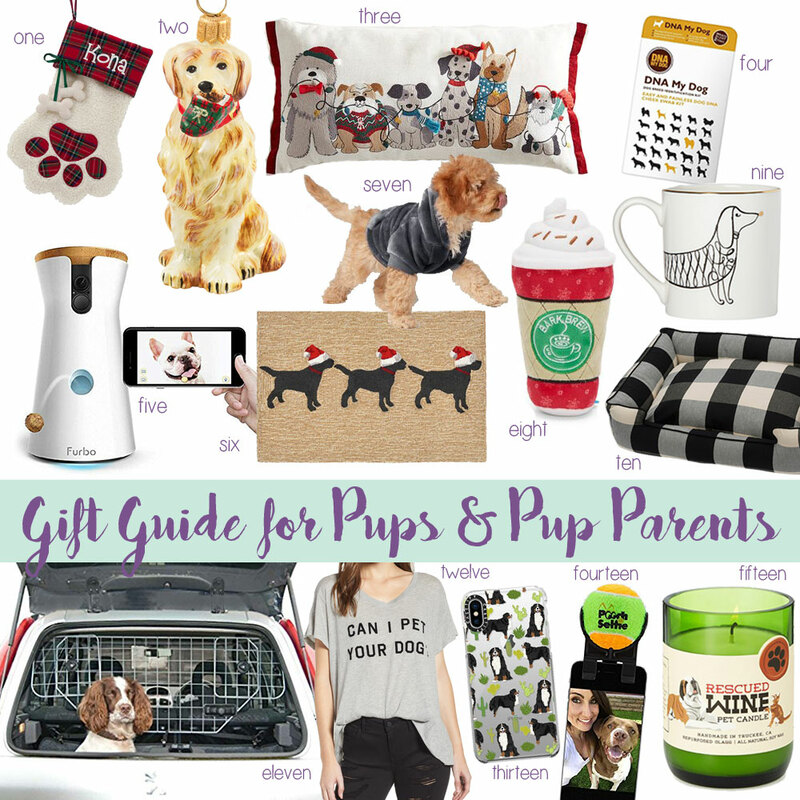 I thought I'd round up some of my favorite dog items and create a gift guide for pups & pup parents! Que the song, "Where are you Christmas? Why can't I find you?" I feel like that more and more with every passing year. It becomes harder and harder to enjoy the magic of Christmas and not get caught up with life, work and busy schedules. I spend more time checking off my to-do-list and trying to avoid Christmas calories than I do enjoying the season. With Christmas being ten days from tomorrow (seriously though, what the heck) it's time to get in the Christmas spirit, hit pause for a few seconds, and enjoy the most wonderful time of the year! I came up with a 15 things that always put a little holiday pep in my step, help me feel festive and help me get in a Christmas mood. Even if I only feel that magic for a few minutes, it's better than not feeling it at all! I'm ready to bring out the holly jolly that has been hiding inside. Is there anything more magical than Christmastime in New York City?! I think not! It has been a lifelong dream of mine to visit NYC during the holidays and I finally checked it off my bucket list....ya'll, it did not disappoint! 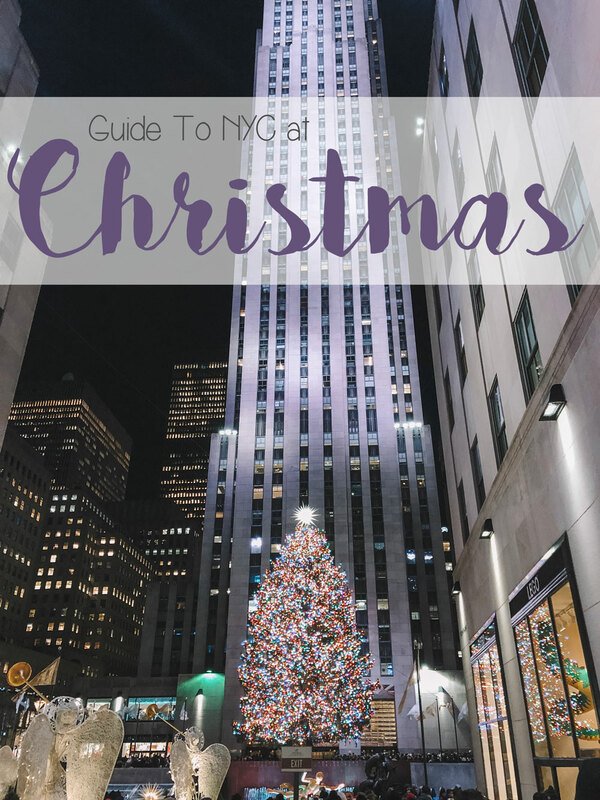 I've been to New York many times before (it's one of my favorite places to visit....see my guide to NYC here) but visiting at Christmas is an entirely different experience. First off, YES it is magical. Second, it is BUSY. Like I said, this was not my first time in the city (I've been three times in the fall and during New York Fashion Week) and I have never seen it as crowded as it was this December. I am 100% glad I went and I very much enjoyed the trip, but I don't think I would go back at Christmas again...it was a lot to handle and take in! That being said, it is definitely worth it to experience Christmas in NYC once if you aren't claustrophobic and don't mind crowds! Since we have been to NYC so many times, we booked this trip with the intention of just doing Christmas-specific things. We stayed Thursday night - Sunday afternoon and it was great!! Scroll on down to see all the holiday activities we took part in. Good morning and happy Monday to you!! I'm writing this from the sky on my way back from New York City. I cannot believe that Christmas is a 15 days away. HOW did that happen? December used to be the slowest month of the year when I was a kid but now I blink and it's nearly halfway over. I'm barely even in the Christmas mood yet....better get on it! I'm slightly freaking out about getting the rest of my Christmas shopping done before the big day. And by 'the rest' I mean almost all of it. Normally I'm on top of shopping and more or less done by now but this year I am so far behind! It seems like every year, no matter how far ahead or behind I am, I save the guys in my life for last. My husband, dad, brother and father-in-law are all sooooo hard to shop for! 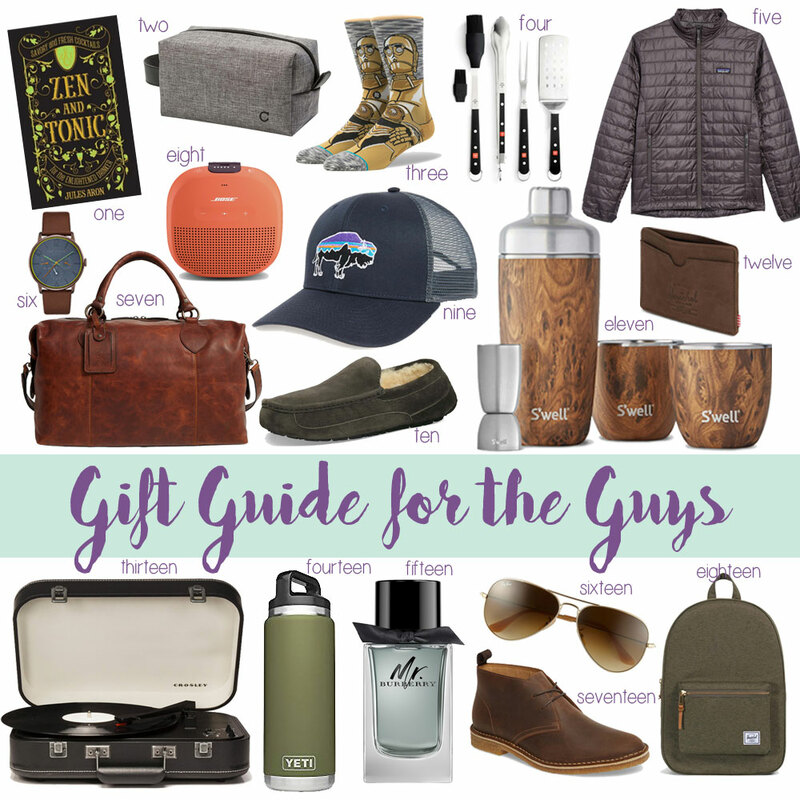 I convinced C to help me put this gift guide for guys together - these are all items he has and loves or items on his wish list this year! He is pretty well-rounded (he likes sports, traveling, hiking, has recently gotten into woodworking, is a master chef and works out a lot) so I think these could work for a variety of guys. Good morning a happy Friday! I'm waking up in New York City this morning! C and I flew in last night and will be doing all the Christmas things. I've been to NYC many times but never during the holidays so I.Am.Ecstatic! I watched Elf and Home Alone 2 this week in preparation haha. You can follow along on Instagram stories throughout the weekend! It seems like everyone and their mother have the tradition of opening one single present on Christmas Eve and for most of us it was always matching Christmas PJs. When I was young I wished I could open a different present instead of PJs but now as an adult I buy myself like six pairs of Christmas 'jams every year. I love them so much! Not sure why pajamas bring me that much joy but it's fine. I rounded up aaaaallll the pairs for you below - a lot of them come in different prints, too! The pair I'm wearing above is only $12 and they are thermals (so warm but breathable and not too hot to sleep in)....I sized up for a baggy fit but I'd say they fit true to size. Confession: I LIVE for holiday parties! I am always looking for an excuse to get dressed up. The holidays make being "extra" acceptable and I'm here for it! I know not everyone spends weeks planning their outfits out, so I thought I'd share some inspiration on what to wear to a holiday party to make it easier for you! Whether it be a Christmas party, New Years Eve, or just a festive night out on the town, my tips are to play with textures and patterns, add pops of red and never underestimate a touch of sparkle. This outfit is actually repurposed from other blog posts.....I ordered the actual outfit I planned on using for this post on Black Friday and it hasn't arrived yet (tisk tisk Macy's & Express......). BUT, I love how this look turned out! 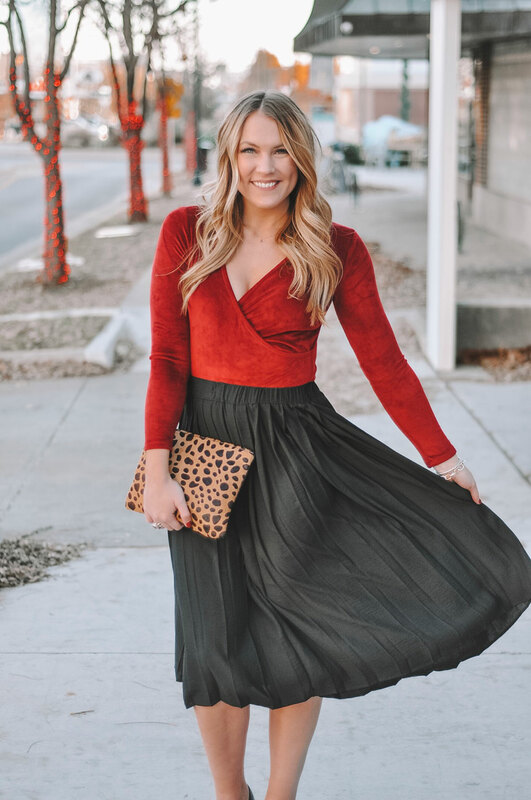 My velvet bodysuit is so soft and the midi skirt gives it some sass without being too dressy. I think it would be perfect for a work Christmas party or somewhere else where you don't want to show too much skin. Ya feel me? I put some other outfits together at the bottom of this post so scroll on down for more holiday party outfit inspo! Like I said, I look for ways to incorporate patterns and textures like leopard, plaid, velvet, fur, leather, sequins, silk, wool, tulle and lots of holiday colors!! It's officially December which means it's time to get shopping! I'm done shopping for one person on my list but I haven't thought twice about what to get anyone else. Yikes! I love looking at other blogger's gift guides for inspo - whether it be for someone else or for my own wish list! 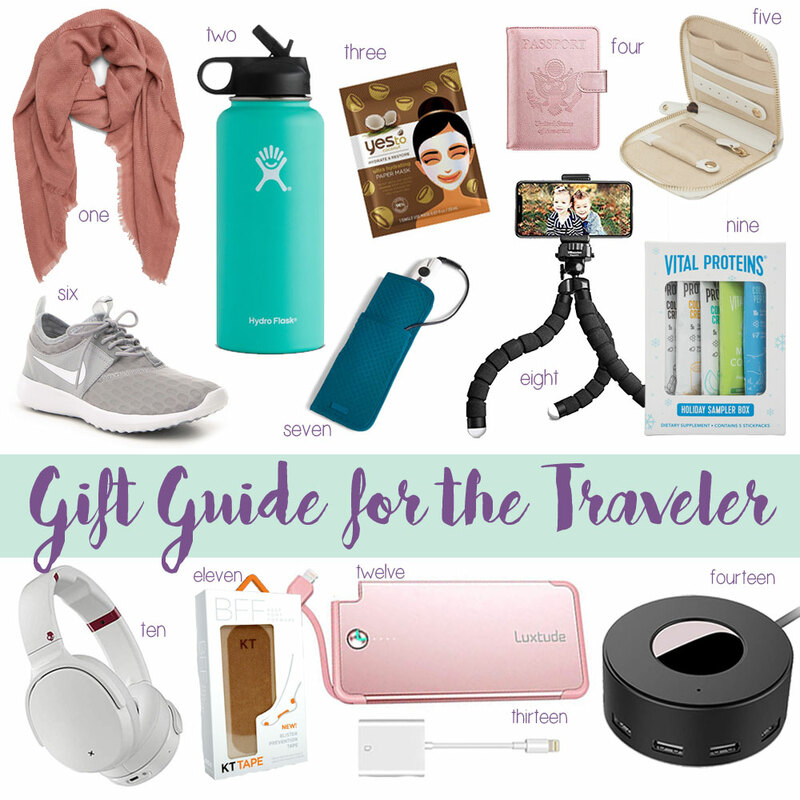 In honor of a fun little Christmas getaway we're taking later this week, I thought I'd put together a gift guide for the traveler in your life! I've been on my fair share of trips this year so I feel pretty qualified to recommend these items - I use and love each and every one.